The below artworks are the most important by Giorgio di Antonio Vasari - that both overview the major creative periods, and highlight the greatest achievements by the artist. Artwork description & Analysis: Painted by Vasari at the age of 22, this is a portrait of Lorenzo de' Medici - also known as Lorenzo the Magnificent - the Italian Statesman and famous ruler of Florence. De' Medici was held by many, including da Vinci, Michelangelo and Botticelli, to be the most important patron of the Renaissance art. He is shown here seated wearing a blue tunic with ermine sleeves surrounded by objects glorifying his reign with Latin inscriptions. The inscription on the vase reads "virtutum omnium vas" (the vessel of all the virtues) which sits on top of the mask of Vice. To his left is the mask of Music with a flute protruding from an eye. The inscription on the column reads "As my ancestors did for me, I honor them by my virtue". Hanging on his belt is a red purse as a symbol of his role as a financier and banker to the Papacy. As Vasari wrote: "My intention [was] to include in this portrait every ornament significant of the great qualities that made him illustrious in life and show that all his honors were solely of this own attainment." The portrait was commissioned by Cosimo I de' Medici, the Second duke of Florence (1537-74) in waiting, as an act of homage (Lorenzo had died in 1492, aged just 43) for one of his most powerful and revered ancestors. Vasari was pleased to oblige his most important patron and acknowledged his debt to the Medici family for their patronage throughout his life. Although an accurate rendering of its subject, Vasari is known to have disliked painting portraits, preferring compositions in which he could avoid a focus on the detail necessary to achieve a likeness of the sitter. We see in this work that Vasari managed to reveal a pensive and powerful patron of the arts. This image, painted in subdued colors, shows Vasari's ability to encourage the viewer's empathy in understanding his subject's power and humility. 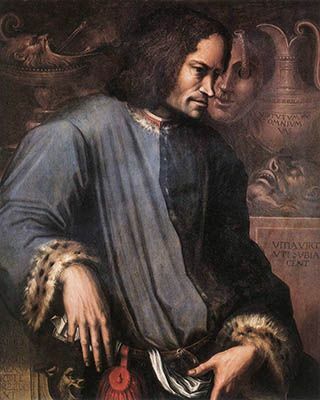 Lorenzo de' Medici was in fact painted by many important artists of the Renaissance including Verrocchio, Botticelli, Ghirlandaio, as well as Leonardo da Vinci in his Portrait of Lorenzo of 1500, and Bronzino. Artwork description & Analysis: The subject of the painting is salvation which is explained by the scrolls carried by angels on either side of Mary: "Those who Eve's fault condemned, Mary's grace set free." Mary is bathed in splendor, with the moon at her feet. In the bottom half of the painting we see Adam and Eve tied to the Tree of Original Sin, surrounded by Abraham, Isaac, Jacob, Moses, Aaron, Joshua and David and other prophets from the Old Testament. Samuel and St John the Baptist are shown bound only by one hand "because they were blessed in the womb." Allegory of the Immaculate Conception was commissioned by Bindo Altoviti, a Florentine banker, for the family chapel at the Church of Santi Apostoli in Florence. 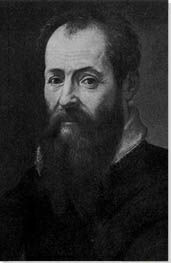 As Vasari himself acknowledged, "I had not executed any work up to that time with more study or with more lovingness and labour." He is said, however, not to have been satisfied with what he achieved despite the time and effort he had put in. Indeed, one of the important paintings of religious subjects by Vasari, it is also one of the most difficult to read due to the excessive number of allegorical symbols contained within the frame. It also calls on the influence of Raphael in the upper part of the painting in which Mary is carried to the heavens by a group of angels; and Michelangelo, in the fluidity and dynamism in the allegorical figures in the bottom half of the painting. Artwork description & Analysis: As its title suggests, this painting shows six famous poets and philosophers from 13th and 14th century Tuscany engaged in conversation. They converse - as they wrote - in the Tuscan language. It shows Dante Alighieri (most famous for his poem about the afterlife, The Divine Comedy) seated, facing Guido Cavalcanti, a poet famed for his love sonnets. To his right is the humanist scholar, Francesco Petrarch holding a copy of his Scattered Rhymes. 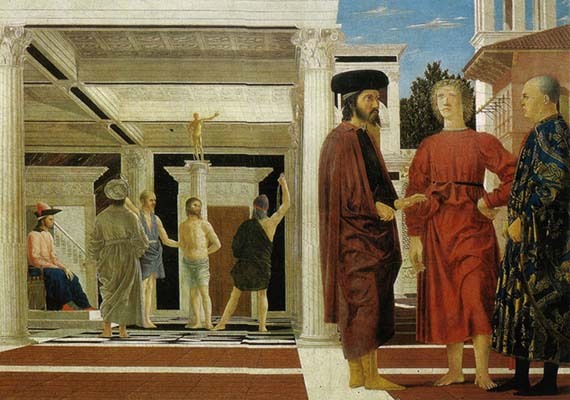 Between them is Giovanni Boccaccio, author of the Decameron, and to the far left are the humanist, Marsilio Ficino and the philosopher, Cristoforo Landino. The four great poets of the Italian language wear laurel wreaths as a symbol of honor. In front of Dante is a table with objects of learning; the solar quadrant and celestial globe representing astronomy, a compass representing geometry, a terrestrial globe for geography, and books for rhetoric. Vasari received the commission from Luca Martini in 1543 to paint this picture as to announce the cultural supremacy of Tuscany, and to help raise Italian over Latin as the language of Italian culture. 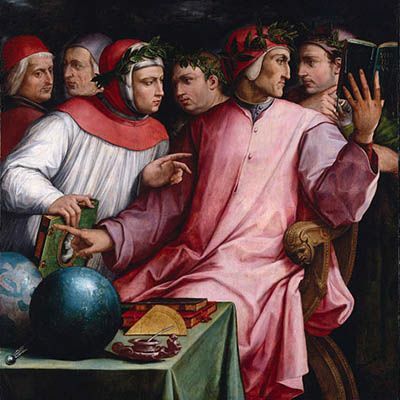 Dante holds a copy of Virgil, one of the great Latin poets, to remind the audience that all six poets in the painting were in fact masters of the Latin language. This was an important detail because some critics have suggested that the men had written in Italian because they were not well versed in Latin. This painting is then an important historical reference to the debate current to the times over the literary standing of the poets and the merits of Italian literature. As Vasari wrote in his The Lives of the Most Excellent Painters, Sculptors, and Architects, "Tuscan genius has ever been raised high above all others." Artwork description & Analysis: This painting was commissioned by the monks of the Camaldoli monastic order for their monastery just outside Florence. It shows Christ's descent from the cross, known as the Deposition of Christ, a subject which was popular for many Renaissance artists, and includes notable examples from Giotto, Fra Angelico, Raphael, Tintoretto and Caravaggio. It shows Christ being taken down from the cross after the crucifixion by Joseph of Arimathea and Nicodemus, accompanied by St John the Evangelist. At the bottom left of the painting we see Mary clothed in blue, in the arms of Mary Magdalene, and surrounded by other witnesses. 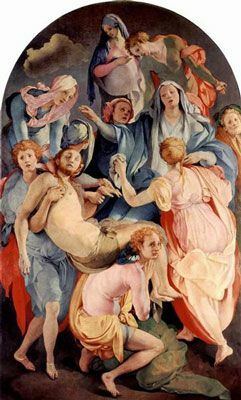 It is interesting to note that Mary is shown fainting. This was a medieval narrative promulgated by the popular book, Meditations on the Life of Christ (c. 1300) and repeated here in Vasari's commission. This narrative was however discouraged by the Counter Reformation with the Council of Trent in 1563. The painting itself marked a change in direction for Vasari. 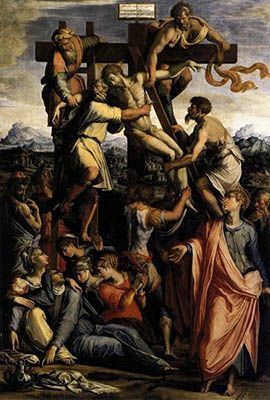 It belongs to the Mannerist style, a technique which took hold towards the end of the High Renaissance in the 1520s. Vasari was here less interested in the subdued tones and subtle shading that characterized his portraits. Here rather he relies on forced perspective, exaggeration and the technique of chiaroscuro lighting to intensify the drama in his painting. Artwork description & Analysis: This is probably the most famous arrangement of Vasari frescos. Collectively they demonstrate his mastery and understanding of the Mannerist style. This great hall, 54 meters long, 23 meters wide and 18 meters high, is the largest and most important room in the Palazzo Vecchio. The Palazzo was originally commissioned by Fra Girolamo Savonarola in 1494 to house the 500 members of the Grand Council of Florence after the Medici were ousted in that year. The hall, built in accordance with the austerity preached by Savonarola, was plain, with little scope for decoration. When Savonarola was burned at the stake as a heretic in 1498, however, his successor, Piero Soderini, commissioned da Vinci and Michelangelo to paint two murals, The Battle of Anghiari and The Battle of Cascina respectively, neither of which were completed. 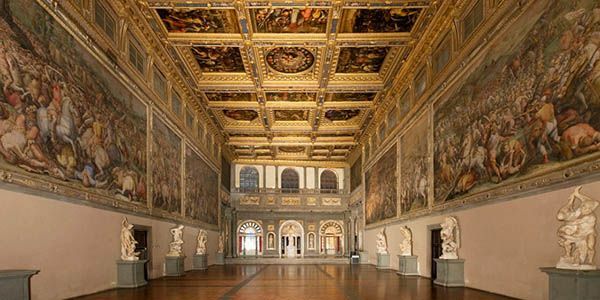 When the Medici returned to Florence in 1512 the hall had fallen into disuse until Cosimo I moved his residence into the Palazzo Vecchio in 1540 and used it to receive ambassadors and public audiences. Cosimo I commissioned Vasari to enlarge and decorate the hall with frescos to celebrate important moments in the history of Florence, and to celebrate his achievements, emphasising his eminence as Duke of Florence. 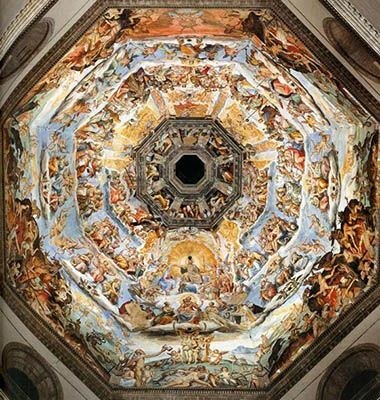 Vasari enlarged the hall by raising the ceiling by seven meters and decorated the hall with frescos comprising 43 panels, 39 of which form the decoration of the ceiling. Despite being separate panels, each with its own motif, Vasari retained harmony and coherence in the fresco through the consistent use of gold, red and brown colors throughout. The centrepiece of the fresco is the depiction of Cosimo I in all his glory as Duke of Florence. This was an important political statement to all who saw it since it symbolized the rebirth of Florence. The other panels on the walls include allegories of Florence and Tuscany, and episodes in the wars of Pisa and Sienna; wars in which Cosimo I was victorious. Artwork description & Analysis: Most of Vasari's architectural work was undertaken in Florence (though he also worked on projects in Pisa, Arezzo and Rome). 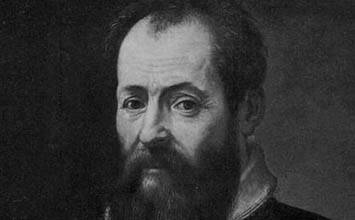 Vasari would work alone or in collaboration on projects with other architects. Arguably his most important collaboration was with Bartolomeo Ammannati with whom he worked on the façade of the Uffizi, the centralized administration building of Cosimo I de' Medici (completed in 1560, the Uffizi's conversion to a major museum specializing in Italian art began some twenty years later). In 1565, Vasari then worked alone on what is known as the Vasari Corridor (Corridoio Vasariano), an enclosed passageway that linked the Palazzo Vecchio, the townhall that overlooks the Piazza della Signoria (and the seat of the Duke Cosimo I de' Medici government) and the Palazzo Pitti, the Duke's regal residence. The Vasari Corridor was conceived by Vasari as a prodigious regal footpath; an exclusive passageway fit to deliver a ruler of integrity and potency to the very heart of his dominion. It was built (over a period of only five months) to commemorate the wedding of Francesco I de' Medici and Giovanna of Austria. 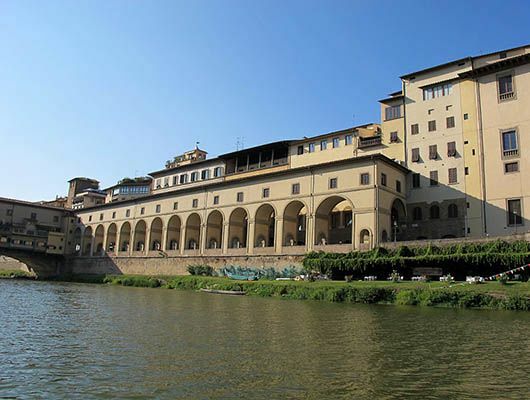 Moving northward, it connects the Palazzo Vecchio with the Palazzo Pitti and its practical function was to link the residence of the Grand Duke, the Pitti Palace, and the Uffizi from where he conducted his business. The covered overhead corridor is almost a kilometre in length, passing from Plazzo Vecchio, through the Uffizi, following the Arno river north, until it crosses the Arno (and the medieval Ponte Vecchio bridge) at Ponte Vecchio. On the other side of the river, the corridor passes through the interior of the church of Santa Felicita, through the Boboli Gardens, over domestic rooftops, before reaching the Palace. Legend tells it that the corridor passed over a meat market and that the market was replaced in 1593 with goldsmiths (who still trade there to this day) so as to save the incumbent Grand Duke from the unpleasant smell on his daily journeys to-and-from his office. Today, the corridor, which can only be visited by appointment, is home to some 1000 paintings dating from the 17th and 18th century. It also displays many self-portraits from the 16th to 20th century including works by Andrea del Sarto, Beccafumi, Bernini, Annibale Carracci, Guido Reni, Salvator Rosa, Rubens, Canova, Ingres, Delacroix and many others. 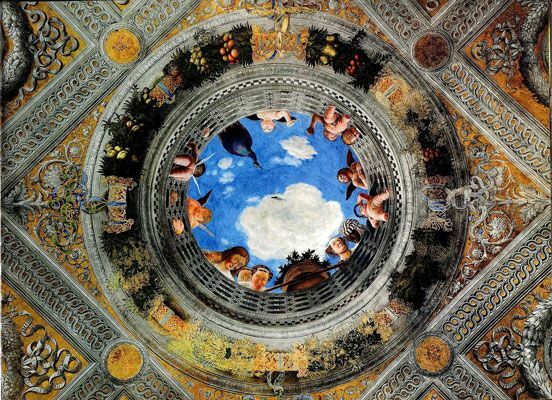 Artwork description & Analysis: This fresco was commissioned by Cosimo I in 1568 for the cupola of the Cathedral in Florence, the Roman Catholic Archdiocese of Florence designed by Filippo Brunelleschi. It comprises a space of approximately 4000 square meters and it was the last major commission undertaken by Vasari before his death in 1574. Up until then, Vasari had only been able to complete the upper part of the decoration representing the 24 Elders of the Apocalypse. Frederico Zuccari, a painter who had studied with Correggio, was commissioned to complete the work which would take a further five years to complete. While Vasari used a pure fresco technique which required the painting to be made on freshly applied wet plaster - thus becoming part of the wall itself - Zuccari used the Fresco-secco technique: a technique of painting onto dry plaster which is much less durable than pure fresco. Vasari forbade artists to retouch their wall paintings after they had dried which, in his words, ''aside from being an extremely vile act [it] also shortens the life of the work.'' (In Zuccari's defence, his use of the lesser secco technique was imposed on him because of strict time restrictions.) 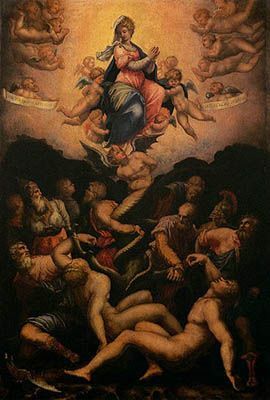 Although not completed by Vasari, it was he who had designed the Fresco which reads with figures of Christ and the Madonna up in the heavens circling down to the world of demons and the torment of the Hell and thus symbolizing the theme of redemption. Divided into six concentric circles, the upper most circle has the 24 elders of the Apocalypse, a group of saints, representations of the gifts of the Holy Spirit, the virtues and the eight Beatitudes (the blessings in the Sermon of the Mount), with the last tier, a vision of Hell full of tormented sinners. What is most remarkable about this fresco is that we see the contrast of styles between Vasari and Zuccari. Vasari's effort offers balance and harmony, a supreme example of the elegance characteristic of the late 16th century. Zuccari's input, however, despite his reputation as an expert draughtsman, seems out of balance and lacks the finish or finesse of the figures of the Elders. As Dr. Acidini, one of the art historians who supervised the restoration of the fresco, commented, "If I didn't know these scenes so well, I would almost say that they were by Francis Bacon or one of the German Expressionists." Of Vasari's excellence, he countered, "In terms of fresco technique Vasari is second to no one. Not even to Michelangelo."